Fall is peeking around the corner, are you ready to head to an apple orchard soon? The dropping temperatures we’ve seen in the last few weeks have been a cool reminder that summer is winding down. With fall right around the corner, many families may be wondering what to see and do in the mitten during autumn. A seasonal fall favorite across Michigan and the country is a visit to the apple orchard; the ripe apples, fresh cider and delicious doughnuts are inviting and definitely worth the trip (enjoy the doughnuts in moderation, of course!). Here are four favorite orchards in Southeastern Michigan for you to check out soon! Yates Cider Mill: Opens for the fall season on August 19th. Check out the cider mill, ice cream and fudge shoppes, petting zoo and more! Blake’s Farms: Open July-December. 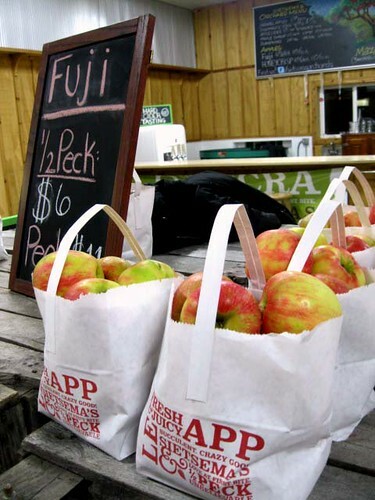 Blake’s has two separate locations to serve you –a Cider Mill and Big Apple Orchard. The Cider Mill has a lot to offer families, including a fall festival, café, nighttime hayrides and much more. Check out the Big Apple Orchard to pick your own apples and pumpkins. Come back after dark for haunted Halloween fun. Apple Charlie’s: Open for the fall season August 1st. Come hang out in the pavilion and enjoy live entertainment while eating some tasty snacks, including cider and doughnuts, of course. Stop by the animal farm to see pigs, cows and other furry friends. Diehl’s Orchard and Cider Mill: Open for the season August 15th. Diehl’s has a lot to offer, including craft shows, corn mazes, a playground and more! Come out for dinner and a hayride or enjoy the festivities at ciderfest.